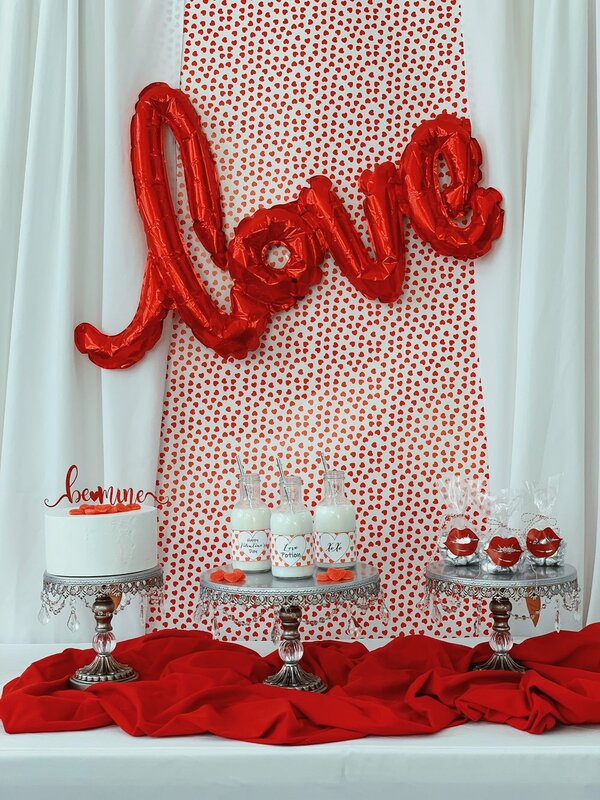 Valentine décor can be fun and simple. By adding a few little touches it can just make it all come together. Plus, I have something special just for you to get you started. Cake just always makes me so happy and excited. I was strolling through Target when I stumbled across heart shaped gummies. I knew I had to have them! I then decided while I was setting up that I was going to add them to the top of my cake since, it was super plain. Did someone say hershey’s kisses?! Give me some more !!! Seriously, they are the easiest and cutest candy to give out! I took a handful and maybe a little more and put them in these cute lip baggies that I created by simply adding red vinyl that I cut out then tied them up with red and white twine. For the backdrop I used gift wrapping paper. I found this one from Homegoods and I just thought it would be a perfect match with the bottle wrappers I designed. Not to mention the gorgeous chandelier stand that are from Opulent Treasures. I hope you were inspired today. If you enjoyed this party let me know in the comments below and make such to Pin It!